About technologies: Configuring single node Storm Cluster. Apache Storm is a distributed real-time computation system for processing fast, large streams of data, adding real-time data processing to Apache Hadoop. A social analytics company called BackType acquired by Twitter developed Storm. You can read more about it in this tutorial. Storm installation can be separated into three parts as follows. Zookeeper is the coordinator for Storm cluster. 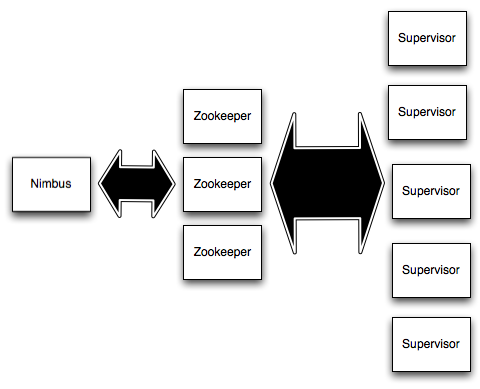 The interaction between nimbus and worker nodes is done through the Zookeeper. Create the data folder and update the conf/zoo.cfg to point to the data folder. By default it is set to /tmp folder which will be cleansed with every boot. Rest of the default settings are good enough. Now your Zookeeper cluster is ready to start. I resolved this error by telling zookeeper where I wanted the log file to be placed. Install the git and libtool packages from the terminal. This are the prerequisites for the next step. Download the code for jzmq. These are the Java bindings for zeromq. Compile and install it. Now we are all set with the installation of Storm. Download the latest Storm and extract it. Now you need to configure Storm so you need to create the Storm configuration file called ‘storm.yaml’ and its present in the ‘conf’ folder of the untar Storm root folder. To start the Zookeeper server go to the ‘bin’ directory of the Zookeeper installation and execute following command. The nimbus service is similar to JobTracker and the supervisor service is similar to TaskTracker in Hadoop. More details about the Storm terminology are specified here. Use the Web UI to check the logs for any exceptions. Go to the Storm UI at http://localhost:8080. <path-to-topology-jar>: is the complete path to the complied jar where your topology code and all your libraries are. <arg1> <arg2> <argN>: the rest of the arguments will be the params that receive our main method. With the Storm running on a single node, now it's time to execute the sample code. Get the sample code from Git. Package the code. storm-starter-*.jar would be created after a successful build in the target folder. Execute the WordCountTopology example. The job is submitted to Storm and the control returns back immediately. The last parameter WordCount is the topology name which can be observed in the Storm UI. Check the logs for any exceptions.